Wasps are social insects, forming large colonies. The queen spends winter hibernating under shelter and emerges in spring to establish a new nest. Her first offspring are workers which take over nest chores. A “paper” nest is made by mixing saliva with wood fibres and grows over summer to reach on average the size of a football, the nest is nearly always concealed, commonly underground or in a roof or wall cavity. Worker Wasps are 12-15mm long, bright yellow with black markings including arrow-shaped marks down the middle of the abdomen with paired black spots on the sides. Wings are long and transparent, antennae black and legs mostly yellow. Queens, usually only seen in winter and spring, are similar but larger (20mm). Workers feed on sweet substances such as secretions from sucking insects, fermenting fruit and people’s food and drinks. They feed their grubs in the nest with other insects and spiders which they catch and kill, or with bits of meat from carrion or pet food bowls. 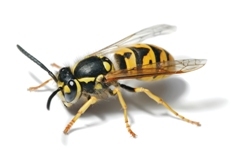 The nest population is on average 5 – 10,000 wasps by the end of summer. The colony will produce and releases new mated queens in autumn then dies out in winter. Individuals react differently to being stung by wasps; some are hardly affected, others suffer considerable pain and swelling and a few become seriously allergic to being stung, which in some cases results in sudden death due to anaphylactic shock. Wasps can also sting you more than once! Honey bees are important beneficial insects and are not normally considered as a pest. They live in nests in the wild, or by beekeepers as colonies in hives. 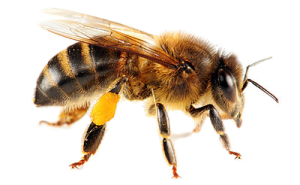 Honey bees will only sting people if they are strongly provoked or feel threatened. Only the female workers and the queen can sting. As their sting is barbed a honey bee can usually only sting you once as the sting is left in your flesh, this stinger should be removed as quickly as possible to limit the amount of venom delivered. Every effort should be made to avoid carrying out an insecticide treatment to eradicate an issue with honey bees and treatment with an insecticide should only be considered as the last resort. If foraging honey bees from another nest find a nest which has been treated with an insecticide, they can potentially carry away contaminated honey and thus infect another nest. This can lead to the contamination of honey destined for food use, effect and eradicate large quantities of bees, and the destruction of hives. Therefore it is vitally important that if a treatment is the only solution every reasonable action to prevent foraging honey bees from gaining access to the treated nest is implemented, this can be achieved by removing the honey combs and blocking the nest entrances. In the Britain there are 24 species of bumblebee out of around 250 different spices from around the world but only eight spices are commonly found. Bumblebees are found in a variety of habitats and most people should be able to attract them to their gardens if they have the right kinds of flowering plants. Unfortunately two UK species have become extinct in the last 80 years and others have declined dramatically. The reason for this is simply that there are now far fewer flowers in the countryside to provide bees with the pollen and nectar that they need survive. Bumblebees play a vitally important role which we shouldn’t take for granted, they pollinate the crops that provide us with food to eat and the colourful flowers in our gardens and the country side. 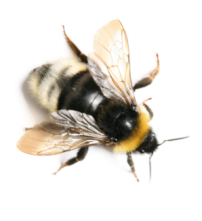 Don’t confuse bumblebees with wasps or honeybees, bumblebees are larger and hairier which makes them perfectly suited for colder British climates. They do not swarm and aren’t aggressive and the females which are the only ones that can sting will only do so if they feel threatened. Bumble bees however can sting you more than once! Bumblebees are social insects and live in nests which often hold fewer than 50 individuals, each nest is ruled by a single queen and lasts for just one year. This is different to a honey bee’s hive which remains active for several years. In early spring the new queen emerges from hibernation to start a new nest, she must first however, build up her energy reserves, so it is really important that she can find plenty of pollen and flowers rich in nectar. Once a suitable site has been found for her new nest she will lay her initial batch of eggs, these eggs will produce female workers whose job it will be to feed and nurture the colony. This process is then repeated throughout the summer with the queen rarely leaving the nest. Towards the end of the summer the queen produces male bees, along with new queens. After mating the males will die off, as does the old queen and all the workers. The newly fertilised queens then hibernate over the winter months and the process starts again. Bumblebees rarely nest in the same location the following year.